Recently, when I was in California I spent an evening practicing holotropic breathwork. I didn’t know much about this beforehand, and you might not either, so I’ll just set the scene. There were about 20 or so of us in a circle, along with a facilitator (whose instructions generally only increased my mystification). After a rambling introduction, he switched on some music, and we divided into pairs. One member of each pair was to be a sitter, whose only job was to observe. The others—the breathers—lay supine on a bed of cushions and blankets. That was me. Our job as breathers was to breathe as rapidly and deeply as possible, preferably making lots of noise. As a physiology geek, this was an interesting experiment to me, so I was diligent in trying to stay with it. It was much harder than it might sound, though, particularly since we had to keep it up for well over an hour. The longer it went on the more spaced out I became, and the more difficult it became to remember what I was supposed to be doing. Eventually I started to experience muscle spasms; my arms and legs began to jerk about uncontrollably. In the end, I couldn’t sustain it. Despite the urging of the facilitator, who periodically came around to rally me with loud whooshing breathing sounds, I found myself falling into longer and longer periods of almost involuntary apnea (cessation of breathing). My friend who was observing told me afterward that my reactions were mild compared to others’. “It was like an exorcism,” she said: thrashing limbs, clenching fists, loud crying and sobbing. My purpose isn’t really to write about holotropic breathwork, which, as I said, I don’t know much about anyway. My point here is that the effects I felt—mental fogginess, involuntary muscle contractions, long spells of apnea—are typical physiological responses to hyperventilation (defined as breathing in excess of physiological needs). So what does this have to do with yoga? I’ll get to that, but for now I’ll just note that many yoga practitioners and teachers—naively, I think—believe that when it comes to breathing, more is better. As you’ll see, however, that’s not necessarily the case; in fact, over-breathing can have very deleterious effects. You might think the problem is too much oxygen. But in healthy people arterial blood leaving the lungs is already nearly fully saturated with oxygen, even during quiet breathing. In other words, you can’t take in too much oxygen. Rather, the problem with hyperventilation comes from blowing off too much carbon dioxide. 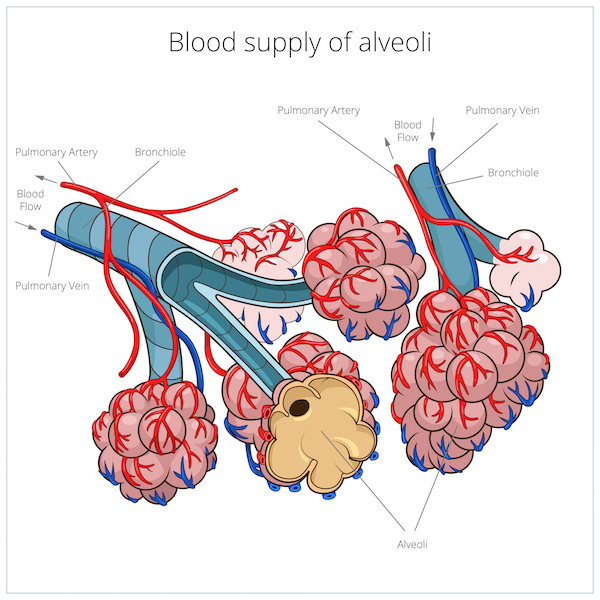 In normal breathing, small amounts of incoming air are mixed with a much larger volume of air remaining within the alveoli (the air sacs in the lungs where gas exchange with the blood takes place). This has the effect of maintaining an internal atmosphere within the lungs that contains a much higher percentage of CO2 than does the air outside (carbon dioxide makes up only a very small percentage of atmospheric air). CO2 levels in the bloodstream closely reflect the composition of this internal atmosphere, so that during hyperventilation, as more carbon dioxide is expelled from the alveoli, CO2 levels in the blood also fall. We tend to see CO2 as a waste product, something to be disposed of. But in fact we need to keep CO2 in the blood within a certain range, because it plays an important role in maintaining blood pH. As CO2 levels drop during hyperventilation, the result is a higher, or more alkaline, pH. Because of this rise in blood pH, hyperventilation has an effect that might at first seem paradoxical—by over breathing, we actually reduce the amount of oxygen getting to the brain, a situation termed cerebral hypoxia. This became an issue during World War II. Hyperventilating military pilots tended to become confused and disoriented. Researchers studying conscientious objectors in the laboratory were able to confirm that hyperventilation led to a reduction in blood flow to the brain, which had long been suspected. Their supposition was this was due to constriction of cerebral blood vessels. This has subsequently been shown to be the case, and although the exact mechanism is still debated, it’s clear that a rise in blood pH triggers arterial constriction. What’s worse is that when blood becomes more alkaline, hemoglobin (the molecule that transports oxygen in the red blood cells) tends to hold on more tightly to oxygen. This makes sense in the context of allocating oxygen to the tissues that need it most: metabolically active tissues that have consumed a lot of oxygen and need to replenish it will have also produced a lot of CO2. This creates a more acidic local environment, which in turn causes hemoglobin to release more oxygen. The reverse is true when conditions are more alkaline; tissues don’t get as much oxygen, because hemoglobin hangs on to it. Thus, the brain gets hit with a double whammy during hyperventilation—less blood flow, plus less oxygen being released from hemoglobin. No wonder those World War II pilots were so disoriented, or that my brain was so foggy that evening in California. In the next installment of this series, I’ll discuss more physiological effects of hyperventilation.